CKEditor can be easily integrated with an external file manager (file browser/uploader) thanks to the File Browser plugin which by default is included in every preset. Once properly set up, all file manager features will automatically become available. This includes the Upload tab (1) in the Link, Image, and Flash Properties dialog windows as well as the Browse Server button (2). Note: Starting from CKEditor 4.5 it is also possible to enable uploading pasted and dropped images. The config.filebrowserBrowseUrl setting contains the location of an external file browser that should be launched when the Browse Server button is pressed. The config.filebrowserUploadUrl setting contains the location of a script that handles file uploads. If set, the Upload tab will appear in some dialog windows — the ones where such functionality is available, i.e. Link, Image and Flash Properties. The sample below shows basic configuration code that can be used to create a CKEditor instance with the file manager configured. Please note that the names of the file browser and uploader scripts used in this guide are just an example and should be replaced with your custom scripts or the scripts coming from an external tool, like CKFinder or a third-party file manager. 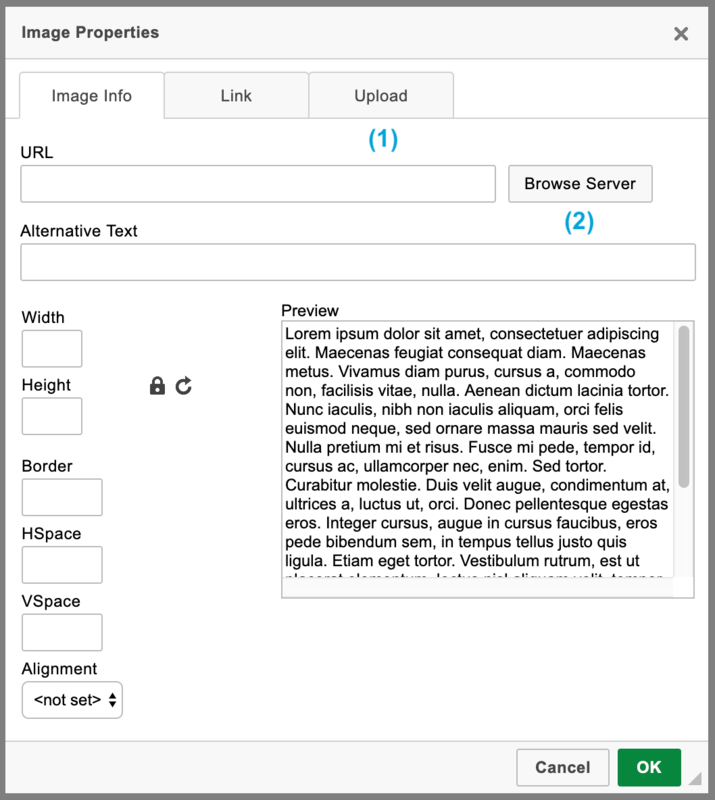 CKEditor integration with a file manager can be customized to your needs. It is possible to only enable the file manager in selected dialog windows (e.g. just for images) or set the file manager window size. Please refer to the Advanced File Manager Configuration article for more details.